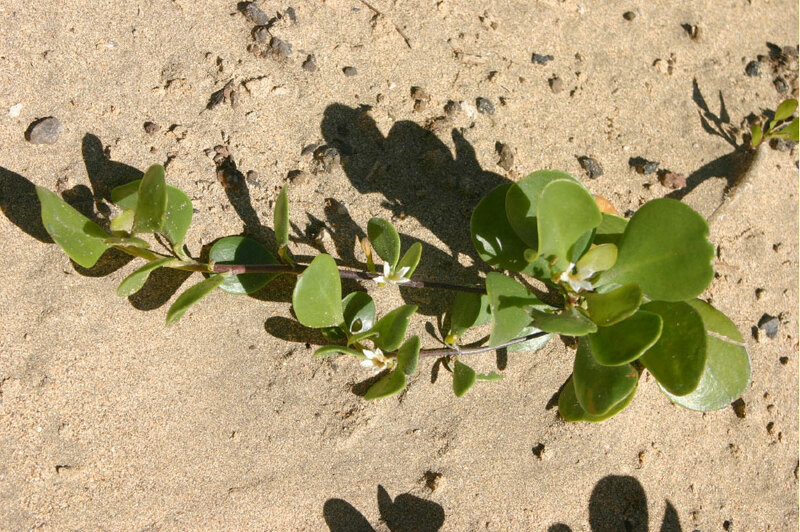 Ten species of naupaka (Scaevola spp.) are native to the Hawaiian Islands in the Goodenia family or Goodeniaceae. The genus name comes from the Greek, scaevus, meaning left-handed or awkward, perhaps referring to the signature half-flowers resembling an open fan or hand. The feature species is one of two native naupakas found along the coastal zones. The generic name Scaevola is derived from the Greek scaevus, left-handed or awkward, perhaps in reference to the “awkward” appearance of the “half flower.” The specific epithet coriacea is from the Latin coriaceus, tough or leathery.Though this coastal shrub would have certainly been known by the early Hawaiians, any use of it is not known.